Russian Thistle is a member of the Goosefoot Family. It grows in a rounded clump with spindly stems to 4 feet in height and has grayish green leaves which grow to 2 inches in length. Young leaves are soft, but are followed with star shaped, light green bractlets with pointy edges. The plant typically grows in areas that have been disturbed by humans or cattle, such as along roadsides and in overgrazed range land at elevations below 7000 feet. 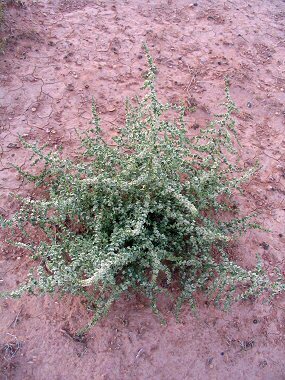 Russian Thistle is the plant that produces tumbleweeds. 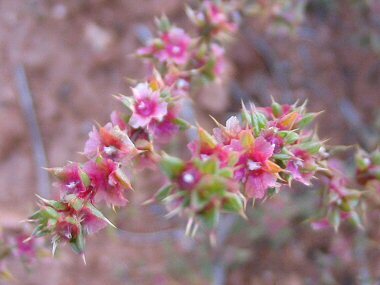 Russian Thistle typically blooms between May - October and produces tiny, white to pink flowers which grow from the base of the leaves on the upper branches of the plant. The plant it not native to the southwest. It was brought to South Dakota in the 1870s in a shipment of flax seed. As the plant ages it forms a large, prickly ball which breaks off at ground level in the wind. As this tumbling weed rolls, it scatters thousands of seeds. That and the fact that no animals will eat it have caused this invasive to take over large portions of the western US.